Overlooking Los Angeles, the Griffith Observatory sits atop Mount Hollywood in Griffith Park. 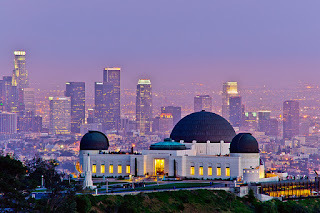 It is an iconic LA landmark that has been featured in several movies and on television. Admission to the Observatory building and grounds is FREE. There is a charge to see shows in the Samuel Oschin Planetarium. Taken from our monthly e-Newsletter. Discover LA: It's More Than Just A Library!